Location: Ibar hotel is situated near a pine forest, in the centre of Borovets, just 250 meters from the ski runs and main lift stations. The hotel offers clean, warm rooms and good service. 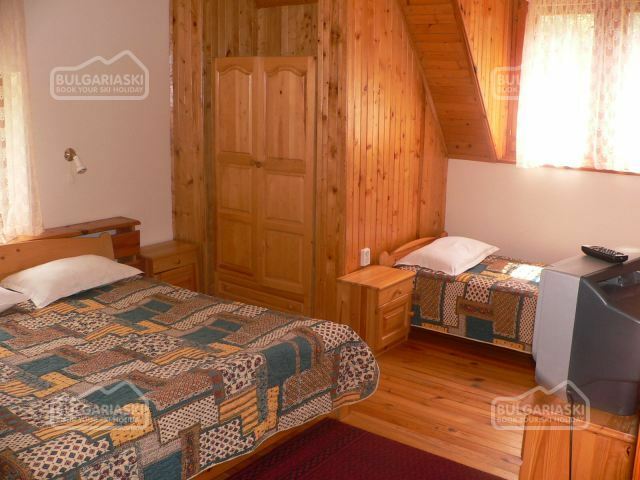 Available are 3 apartments for 4 pax, 1 triple room and 2 double rooms. 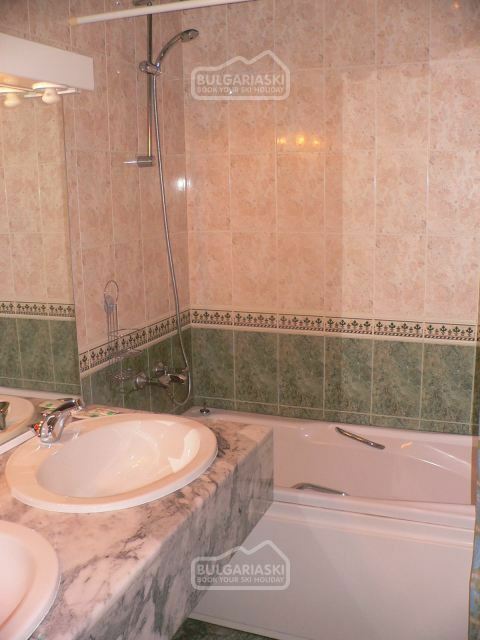 Room and hotel facilities: All rooms have cable/sat TV, private WC and bathroom. The hotel facilities include sauna, a kitchen with full cooking facilities, a dining room, table tennis, car parking lot, bar. Rooms and facilities in detail: The hotel has 3 floors. On the 1st floor there are a large sitting room, with a fire place, used by all guests of the hotel. 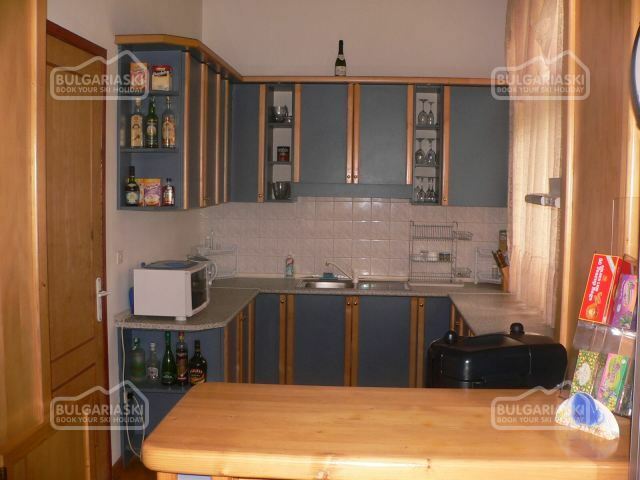 Also there a kitchen where guest can cook their own food, a dining room where breakfast is served, sauna, table tennis room. On the 2nd floor there are 2 apartments, each of them including a bedroom, a separate room with two beds, a big luxury bathroom (private) and a WC (private). 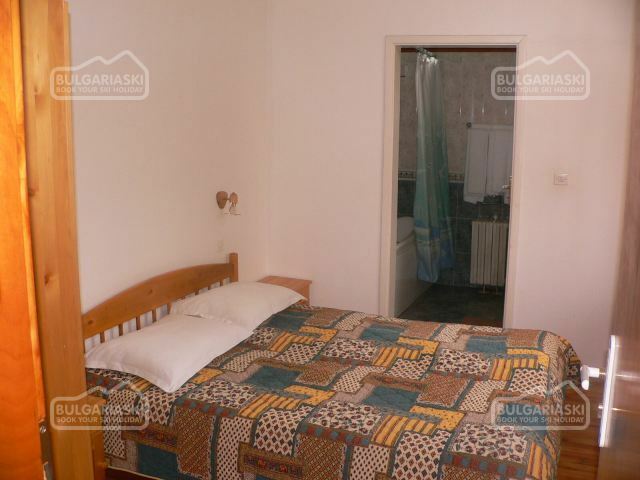 The apartments are suitable for 4 persons, and are ideal for family or friends. 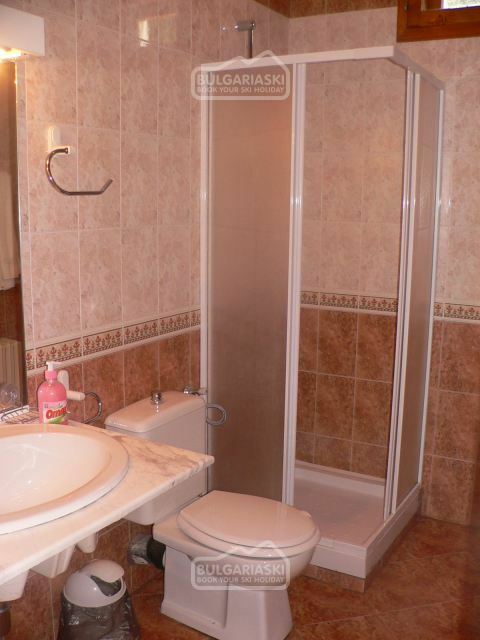 On this floor there is also a double room with private WC and shower. On the 3rd floor there are triple room with a big bedroom and one separate bed, with private luxury bathroom and private WC. 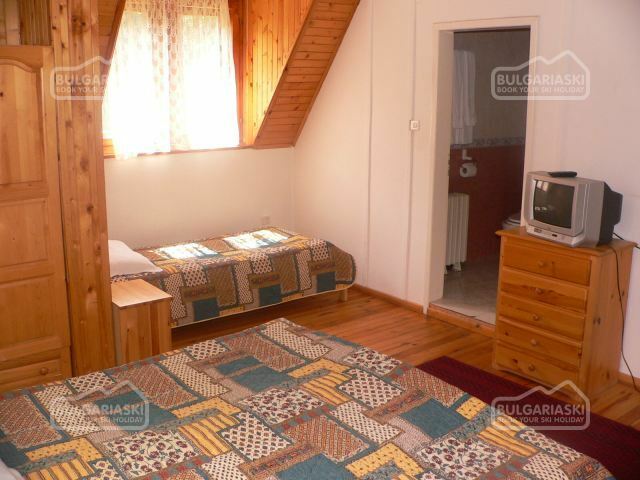 On this floor there are also 1 double room and 1 big apartment (for up to 4 persons). The hotel can accommodate upto 20-22 persons so it is be a good choice for a party of friends who want to stay together. Good option for those on budget who prefer to cook their own food. 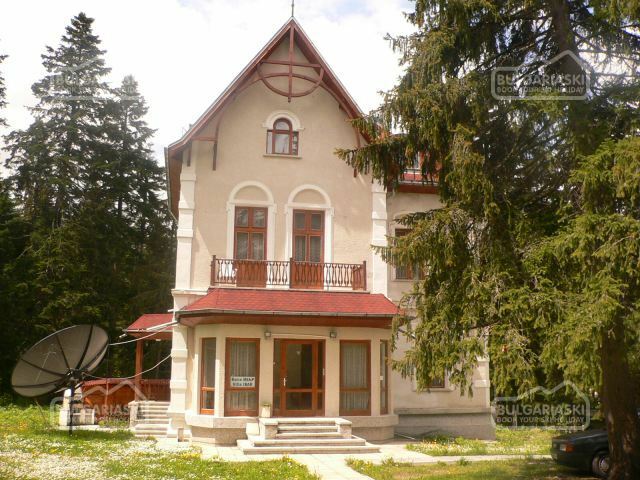 Perfect location, within few minutes walking from the resort attractions and lift facilities. Sauna and tennis table are in the basement. My son and I stayed here in Feb 06. At that time, there were only 2 other guests, so it was VERY quiet. The owners and staff were very pleasant, though spoke little or no English. They also smoke a lot (downstairs), so be aware of this if it offends you. The location indicated by clicking on the Location link on this web site is wrong! It is actually just behind the Kaplina hotel, so much closer to the lifts and slopes than the map indicates. If the snow is good, with a bit of ingenuity you can ski direct to the Sitnyakovo Express 4-Man Chair lift - leave the hotel and walk up the hill about 10m and ski from there across the entrance to the Ski Jump and through the trees - you come out on the bottom of the Cherveno Zname run, level with the entrance to the chair lift. 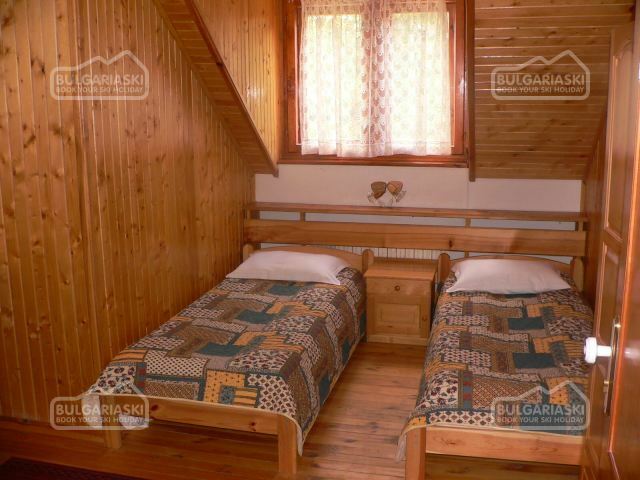 I would recommend this hotel, though I think it would be better if you were part of a large group, where you could treat it much as you would a chalet. It looks like they are in the process of extending the hotel, which will increase its capacity. We have been in the villa Ibar (again) in the first week of january 2006. Nothing has changed: the people are as friendly as last year and the service is still very good. The rooms are clean and the breakfast is good. We can recommend it to others! Wir möchten bei Ihnen im Júli 2mal absteigen. Wir sind eine Familie mit 2 erwachsenen und 2 Kinder.Können sie uns eine Preisanebot und freie Termine geben? Guys, If you understand what decent service is, DON'T stay in IBAR hotel. The owner has no clue who customer is and how he should behave. You will be surprised with MANY ADDITIONAL charges and socialistic tricks that the owner Alexander practices. Alexander is a lier and tries to fool you every time. This is called UNDECENT BUSINESS PRACTICE. You can email me with questions. W've been in hotel Ibar in the forst week of february 2005. 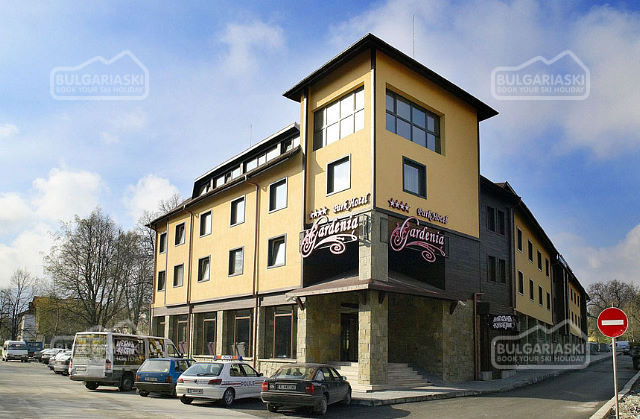 It is a cosy, fine hotel.The hotel is not far from the center, it takes a 10 minutes-walk. The people are very friendly and the breakfast is very good! we were very statisfied and will visit the same hotel again in March 2005. We look forward to it. Здравствуйте! Мы отдыхали в Боровец с 25.03 по 1.04. Впервые мы были в Болгарии и впервые мы встали на лыжи. Это был чудесный отдых - и с точки зрения обилия снега и с точки зрения организации. Все, кроме полета, мы заказали через этот сайт и остались очень довольны. В аэропорту Софии нас встретил представитель фирмы Николо и отвез в Боровец. Гостиница ИБЕР нам очень понравилась - это небольшой семейный отель, оформленный в стиле Кантри, чистый, уютный, с домашними завтраками, с вечерней сауной. Представитель фирмы в Боровце - Влади - снял для нас лыжное снаряжение, подъемники и инструктора на 6 дней. Катание было замечательным, много снега, изумительная природа - леса, покрытые снегом, и среди леса лыжный маршрут, по обеим сторонам которого мы видели белок и зайцев. Еда в Боровце совсем дешевая, нам очень понравился ресторан в отеле Альпин, почти каждый день мы обедали именно там. Еще раз хочу поблагодарить организаторов нашего отдыха - фирму "Профитурс" - за незабываемую неделю. 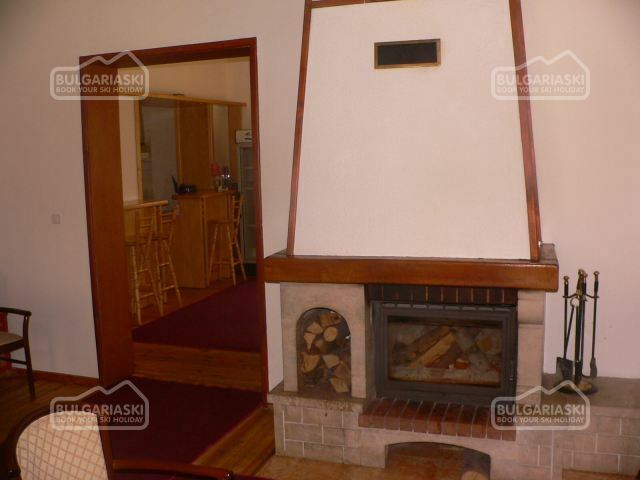 Please, post a comment on Ibar hotel in Borovets.